With visitors arriving in a couple of days and being busy preparing for them, we decided to eat out and our choice was one of our favourite restaurants, Al Shaheen in Karakum where you always have a warm welcome and can be assured of a good meal. 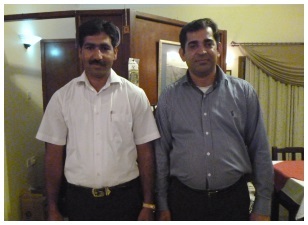 When we arrived I was surprised to see Ashraf at front of house, he is usually busy in the kitchen so it was nice to see him greeting the customers and of course Imtiaz was there making sure everyone was happy. We spotted some friends, Mike and Pam Kennedy, who said they nearly always go to Al Shaheen on a Saturday night and have been doing so for a long time. We had a brief chat and as their starters arrived we settled ourselves down at our table. We were both very hungry so ordered Poppadoms, a Starter and a Main Course. By the time we had worked our way through all of that we were decidedly full to say the least as the meals are very generous as well as being excellent quality. We sat and chatted to our friends for a while before they left for home and as we were about to leave we started talking to a couple who were also about to leave. 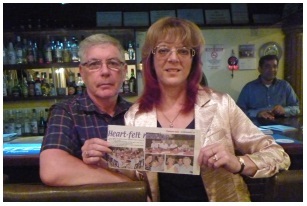 This was Colin and Helen Richardson, an English couple who previously lived in North Cyprus but decided to go back to the UK a few years ago when Helen developed a heart problem and in October 2010 Helen underwent a heart transplant operation at Papworth Hospital in Cambridgeshire. Since then she has gained a new lease of life and although she will have to take expensive medication for the rest of her life she is passionate about organ donation and what can be done to encourage people to donate organs. We suggested that perhaps she would like to write an article about her experience to publish on our website and she promised when they arrived back in the UK in a few days time she would see what she could produce as an interesting and informative article. 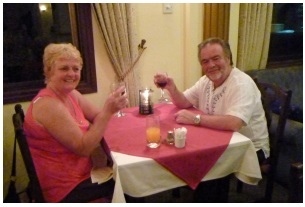 Colin and Helen are good friends of Imtiaz and he stayed with them when he visited the UK last year. Imtiaz said they had been friends for some 9 years and he considered them very much as his best friends. 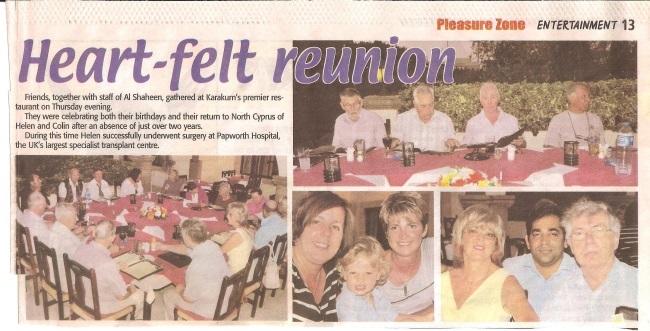 Some time after Helen’s heart transplant, she and Colin returned to North Cyprus for a visit and Imtiaz arranged a celebration party for them which was published in a local newspaper. You can see the article below. This entry was posted in Our Friends and tagged Al Shaheen, Cambridgeshire, Helen Richardson, Imtiaz, Karakum Desert, North Cyprus, Northern Cyprus, Papworth Hospital by kyreniacatkin. Bookmark the permalink.